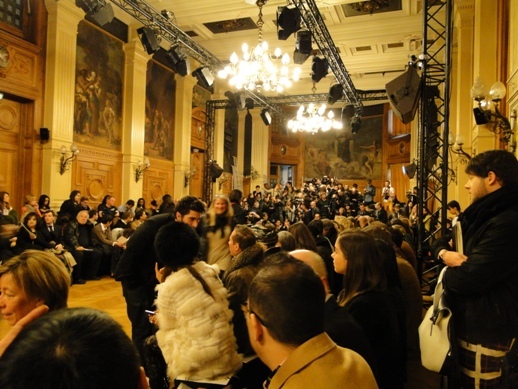 My favorite time of January is when Paris Haute Couture Week starts, and I am one of the few lucky ones that get an invite to view the collections. Haute Couture is the whole reason I moved to Paris over 4 years ago, and I can honestly say that I am just as infatuated with it, if not even more now! The workmanship that goes into the pieces for Couture is like nothing else that is made today. In a world dominated by mass production, it is beautiful to see these works of art made by hand by skilled workers using old word techniques. The first show I attended is always my favorite due to the high amount of Swarovski crystals they use in their designs. On Aura Tout Vu once again put on an amazing show, sending models down the catwalk in designs covered head to toe in giant crystals. Monochromatic in color, the clothes created a sparkling beautiful scene. 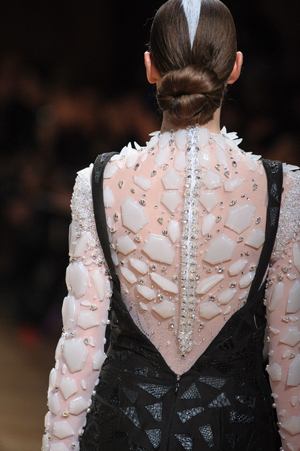 Most of the designs were very structured, reminding me of crystallized suits of armor. 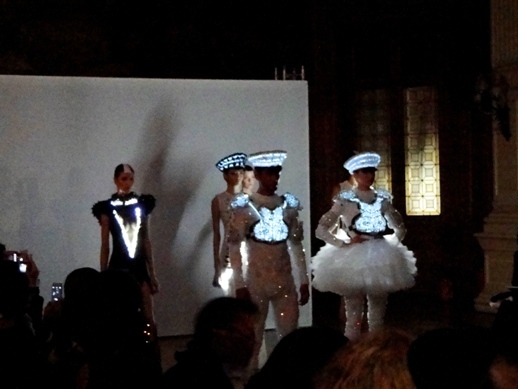 The surprise came at the end of the show when the runway lights went out and the models came back out on stage with parts of the designs lit up. It was then that I noticed they had little battery packs strapped to them in little arm bands. Personally I didn’t think they needed to to this little stunt with the clothes and thought the show would have been better without it. However, it was still a wonderful show as always with excessive use of crystals, just the way I like it! And i’m glad reading your article. But want to commentary on some normal issues, The site style is perfect, the articles is actually nice : D.